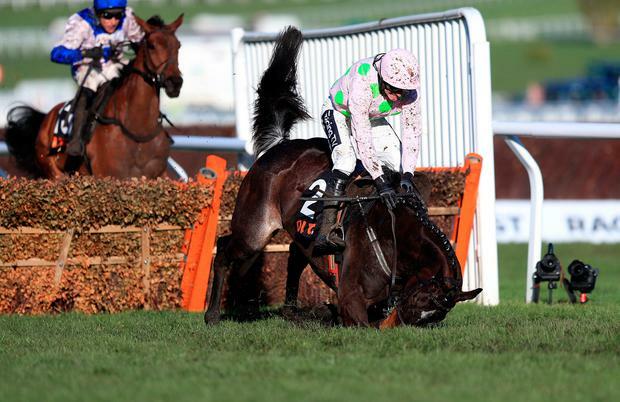 Benie Des Dieux ridden by jockey Ruby Walsh goes down in the OLBG Mares' Hurdle during Champion Day of the 2019 Cheltenham Festival at Cheltenham Racecourse. Simon Cooper/PA Wire. Roksana emerged victorious in the OLBG Mares' Hurdle at Cheltenham after red-hot favourite Benie Des Dieux crashed out at the final flight. Trainer Willie Mullins had claimed this prize nine times in the 11 previous years it had been run - with the remarkable six-time winner Quevega joined on the roll of honour by Glens Melody, Vroum Vroum Mag and Benie Des Dieux. Having already won the Supreme Novices' Hurdle with Klassical Dream and the Arkle Trophy with Duc Des Genievres, Mullins looked to have outstanding claims of completing an opening-day treble, with Benie Des Dieux the 10-11 favourite to successfully defend her crown. Everything went according to script for much of the two-and-a-half-mile journey, with Benie Des Dieux always travelling strongly while her stablemate Stormy Ireland cut out the running. Ruby Walsh eased Benie Des Dieux to the front before the home turn and she was well in command when she crashed through the final hurdle and came to grief - an almost carbon copy of the fall suffered by Annie Power for the same connections in this race four years ago. Her exit saw the Dan Skelton-trained and Harry Skelton-ridden Roksana left in front and she managed to hold the rallying Stormy Ireland at bay by two and a quarter lengths. Another Mullins runner, Good Thyne Tara, was third.